In Quebec, the authorities have developed a way to help colorblind drivers determine when the signal is red. The signal has two red indications, one on each side. All other indications (green and yellow balls, and any arrows) have a single indication. Also note the reflectorized outline around the signal backplate. That low-cost countermeasure for colorblind drivers provides a significant benefit to all by increasing the conspicuity of the signal. Just ran across a study showing a 36% decrease in right angle crashes by installing 2 red signal indications. In this era of Light Emitting Diodes it will be easy to convert traffic signals from Red, Yellow, Green to Blue, Yellow, Green. By using a dual light for stop (using both red and blue for some years) the public will learn that blue and red mean the same thing. After those years, converting the red/blue lights to blue will be clear. All but the totally colorblind can distinguish between blue, yellow, and green. In the case of single-red-lamp traffic signals, a split screen, so to speak, lamp could be used. That is: the stop lamp can be divided into both red and blue via selective use of red and blue LEDs. 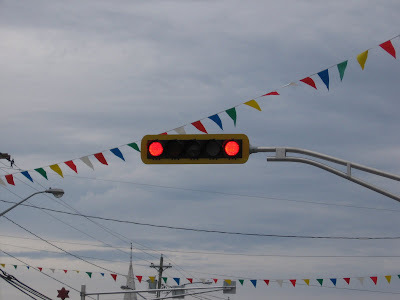 Again, after a number of years with both red and blue, the public can be weened off of red, yellow, green traffic lights and onto blue, yellow, green lights. Very interesting idea, and I agree that the technology is there. I'm sure some of the "higher-ups" in the traffic control world would balk at using a color other than red for stop, but the concept of weening them off red over the course of years (or decades) or continuing the use of blue and red is promising.